Millennials have taken technology and web savvy to a whole new level. In fact, this group is referred to as the “always on” generation. The majority of the Millennials not only text almost non-stop, but they take their SmartPhones to bed with them. The majority of this generation has several social media profiles and they communicate with their friends electronically. Millennials are having a profound effect on many areas of all industries. This group gets bored easily, has a shorter attention span, and uses mobile technology to socialize. Therefore, because they no longer need to physical go to a location such as an amusement park, the entertainment industry is coming up with a variety of ways to integrate real world experiences with technology so this group will still have to physically go to their parks to get these experiences. As opposed to all other generations that flipped through a list of channels of programs being offered to find one that was of interest to them, this generation prefers immersive content experiences they can be involved in the shows. There are some that revise their content based on comments left by viewers. Videos are frequently short clips, which works for this generation that has a shorter attention span that previous generations. Additionally, rather than watching shows as their predecessors did, via television shows, this group prefers to use social media to watch shows because they can have discussions with their friends online during the shows. convenience, natural, fresh, and healthy ingredients. When they dine out, they want to do so whenever the mood hits them and therefore, restaurateurs will need to accommodate those whims if they are to remain in business. Additionally, provided that food purveyors remain in tune with this tech-savvy generation and by keeping it affordable, fun, and healthy, provide interactive capabilities, and be part of the social scene, they’ll be able to capture the attention of Millennials. Retail Industry. Millennials do still go to physical stores and meet with their friends. The retail industry would be smart if they concoct novel ways to incorporate technology into their methods of sales such as providing indoor and outdoor locations where friends can safely meet (violence is monumental in this generation) and use their technology while at these “retail parks”. Communications industry would be wise to use the concept that technology, which is an integral component of today’s day-to-day life with regard to learning, communicating, researching, socializing, etc. From the perspective of Millennials, that is one element of their life and has had a negative impact on their lives because they’ve lost privacy, are ‘always on’. The companies that find ways for this generation to remain ‘always on’ but are able to do so without constantly looking at their screens rather than interacting with others, will be the winning companies. Parks are beginning to include a variety of realities to offer their guests experiences that they could not experience online and would have to be there in person to enjoy. They are integrating augmented and alternative realities, real world and digital world experiences. Additionally, some amusement parks are providing current technology in wristbands that permit their guests to experience experiences and immediately share those experiences with their friends via IM, SMS, and social media networks. To decrease entry into the parks, some parks, such as Disney, replaced their turnstiles with RFID sensors. Disney is also experiencing new technology by providing MyMagic+ Magic Bands. Through the use of this new technology, Guests can personalize some of their visit prior to going to the park. Other retailers would be wise to look at Walt Disney’s history because he always demanded that his company get out in front of technology so that he could always be the first to capture the attention of the majority of the population. He knew that the first one to capture the population’s attention would have a huge advantage over other companies. 1st time in history that four generations are in the workforce simultaneously, which proves particularly challenging due to the “generation gap”. People are living longer; however, each generation is driven by the catastrophic motivators that occurred during their youth. As far as computers are concerned, Millennials are being promoted on the fast track because they know nothing but computers and can resolve problems through use of technology, leaving Traditionalists and many Boomers in their dust. These guys love change and adapt quickly. Keep it short, fun, and interactive. Recognize that this group is extremely smart and picks up on things very, very quickly. Don’t belabor a conversation about any particular topic because more often than not, they understand what you’re trying to say before you get it out! Make emails / memos succinct; the subject field should sum up the entire document. If covering multiple topics, put the most important point first because they most likely will not read an entire document. Even better yet is to section a conversation into different times and keep each conversation very short. Because this generation has known computers all their lives, they do most things with this technology. In fact, rather than playing outside with friends as their parents, grandparents, and great grandparents did, this generation networks with their friends through social media. They’re whiz kids with technology and as creative as they are, it’s a fair guess that this generation will perfect the technology beyond imagination and will accomplish great things. Provide well-defined goals, state objectives and desired results, what is expected of them; let them decide the steps they need to take. They’ll find creative ways to accomplish the goals that no one ever thought about previously! 1986: February 3: Pixar was founded. There is a reason that I am entering Pixar in this generation, so please read on. It was originally called “Special Effects Computer Group” and had been created to assist George Lucas’ company Lucasfilm with their computer related tasks such as special effects and visual effects. It was bought out by Apple Computer co-founder, Steve Jobs, who renamed it Pixar. According to the Karen Paik and Leslie Iwerks who authored a Pixar biography, the name comes from a combination of PIXAR (Spanish verb to make pictures) and the AR from RADAR because it had a ‘high tech’ feel to it; hence: Pixar in upper and lower case so people don’t think it is an acronym. Pixar was bought out by Disney in 2006. And, that is why I entered Pixar in the millennial generation because although they were founded in 1979, the bulk of their business was during the millennial generation. Movies that Pixar made were: Toy Story, A Bug’s Life, Toy Story 2, Monsters, Inc., Finding Nemo, The Incredibles, Cars, and Ratatouille during the millennial generation. 1958: Although this happened long before the millennial generation, because it was the originator for so much that happened regarding computers in this generation, I wanted to enter this part in this generation. President Eisenhower requested funds to create the United States Defense Department’s advanced Research Projects Agency Network (ARPAnet), which was the precursor to the World Wide Web as we know it today. Protocol (HTTP), HyperText Markup Language (HTML), and website addresses known as Uniform Resource Locator (URL) were all created. MiniDiscs (MD). Grolier, which was one of the largest publishers in the USA stored its entire Academic American Encyclopedia of more than 30,000 entries and 9 million words on a CD and it only took up 12% of the CD. The Digital Optical Disk (DVD) followed and that had even larger storage capacity than CDs. Although there were many software packages released during this time period, because I’ve been a Secretary for most of my adult life, I focused primarily on spreadsheets and word processing software. Excel supported charts and graphs generated from specified groups of cells and offered “Clippy” the “office assistant” (help). Quattro Pro was released. Initially it was named “Quattro” (Italian for ‘four’); but was changed to Quattro Pro. It worked using many of the Lotus 1-2-3 keyboard commands. Y2K Scare: up to this point, computers were all programmed so that when two digits were entered in the “date” area (i.e., ‘81’ or ‘82’, etc. ), that the computer would automatically “assume” that the date would be “1981” or “1982”, etc. The problem with that was at midnight on December 31, 1999, all computers would shut down. By this time, computers were used by the military, airport radar, hospitals, police, traffic lights, banks, grocery stores, and everything else that was controlled by computers. People were concerned that supermarkets would not be able to scan barcodes for food items and therefore, they began to stockpile unperishable food items and the last couple days of 1999, they cleared supermarket shelves of perishable items in anticipation of not being able to buy foods if computers did shut down. Information Technology departments around the world increased their staff, who all were onsite at all the companies to be available at midnight so they would be available to make immediate corrections. Of great interest, only minimal millennium bugs occurred and were squelched and no catastrophe ever occurred. WebTV was introduced by Microsoft and for the first time, end users could send/receive email, Instant Message, chat, and perform other tasks through their television which up to that point in time, had been done using computers. eBay was founded, which permits end users interact with auctions to get a variety of products. HOTMAIL was started and was a free online email service, which was acquired by Microsoft in 1997. Internet domain registrar and web hosting company, Go Daddy, was founded. reuse. The space shuttles were was comprised of: Enterprise: 1977 – 2012, Columbia: 28 flights from 1981 – 2003, exploded 2/1/2003, Challenger: 10 flights from 1983 – 1/28/1986: explosion, Discovery: 39 flights from 1984 – 2012, Atlantis: 32 flights from 1985 – 2011, and Endeavour: 25 flights from 1992 – 2012; all space shuttles completed a total of 134 flights. Enterprise STS (Space Transportation System), named after the television series Star Trek, ran from 1977 until 4/28/2012, which was its last flight. It was built without a heat shield or engines, so it never flew into space. Its purpose was to conduct a series of critical tests: approach, drop tests, glide tests, and landing so that astronauts learned what to expect during trips on shuttles that did go to and from space. It is currently located in the Intrepid Sea, Air & Space Museum in New York City, NY. The museum was closed after damage caused by Hurricane Sandy in 2013; however re-opened again in July 2013. Columbia was the first reusable spaceship and first American orbiter space shuttle to go into space. It was named after a small sailing vessel that was one if the first ships of the US Navy to circumnavigate the world. It was the first space shuttle to land back on Earth by gliding down a runway rather than splashing into the ocean. Its first missions were test flights to document that shuttle design was sound. During its series of flights it deployed a variety of satellites and operated as a laboratory in space. One of its missions was to repair the Hubble Space telescope by correcting an abnormality of the mirror and install a corrective optics package. Columbia also positioned NASA’s Chandra X-ray Observatory during its 27th and last successful mission. Upon re-entry back into Earth’s atmosphere (February 1, 2003) of its 28th flight, a small piece of foam that had broken off the external fuel tank and struck the left wing when it launched from Kennedy Space Center in Florida (January 16th) caused the spaceship to break apart during re-entry, killing all 7 astronauts on board. Challenger: named after the British research ship HMS Challenger that conducted research tests in both the Atlantic and Pacific oceans in the 1870s. It was the 2nd operational shuttle and delivered to Kennedy Space Center in July 1982; initial purpose was a vibration test vehicle to test and validate effects of launch, and re-entry stress. Other accomplishments were: the first spacewalk with jetpacks, first satellite tracking and data relay system were completed during Challenger’s maiden voyage, it launched the first American woman into space, was the first orbiter to launch and land at night, and carried two US female astronauts. It had Spacelabs 2 and 3 on board, was the first German committed spacelab. It pulled the Solar Maximum Mission satellite out of orbit, repaired it, and returned it back into service. It deployed two telecommunications satellites for Canada and Indonesia, and released communications and weather satellites into orbit. It was the first time a space shuttle landed at the same location where it had launched. On January 28, 1986, the main liquid fuel tank exploded 73 seconds after liftoff due to a leak in the joints of one of the solid rocket boosters and all 7 crew members died. NASA called an immediate halt to the Shuttle program until the solid rocket boosters were re-designed and new safety management reforms implemented. It should be noted that the many successful missions and discoveries made by the Challenger paved the way to better spaceflights so that more discoveries can be made. Discovery: The 3rd space shuttle orbiter. As with all the other orbiters, the Discovery was named after two oceangoing research or exploration vessels; (1) Henry Hudson made many voyages in the effort to discover the Northwest Passage, in search of a waterway that connected the Atlantic Ocean to the Pacific Ocean in northern North America. (2) Also, Captain James Cook traveled on board the HMS Discovery and discovered the Hawaiian Islands. Discovery deployed the Hubble Space Telescope, repaired, and then upgraded the Hubble and was also used to help build the International Space Station. In 1998, Discovery carried John Glenn back out to outer space, when he was 77 years old. In 1962 was he first American astronaut to orbit Earth. The Discovery launched the first Russian cosmonaut on board an American spacecraft, which was the first mission to participate in a joint USA/Russian Shuttle Mir program. It delivered the Permanent Multipurpose Module Leonardo (primary use to be for storage of spare parts, supplies, and waste) to the International Space Station () and installed it, thereby completing the USA’s portion of the orbiting lab. Discovery is currently located in the National Air and Space Museum in the Steven F. Udvar-Hazy Center, in Chantilly, Virginia. Atlantis: named after the two masted Woods Hole Oceanographic Institute’s primary research vessel. It sent probes to Venus and Jupiter and carried the Destiny laboratory to the International Space Station. Although the USA and USSR began the Space Race as rivals; collaborations have evolved and we now work in tandem. To that end, it made seven missions to Russia’s Mir Space Station, delivered two Russian cosmonauts to start their several month long stay on MIR, several supply missions to the International Space Stations, and linked the Atlantis and MIR together to form the largest spacecraft in orbit. Its final flight will be to service the Hubble Space Telescope. It launched planetary probes (Magellan and Galileo) and because of the extensive scientific experiments that it conducted, it expanded space research in Earth’s low orbit. In 2011, the space shuttle program flew its last flights. Atlantis is currently located at Kennedy Space Center Visitor’s Complex at Cape Canaveral, Florida. Endeavour: (1992 – 2011) named for the British ship HMS Endeavour and the only shuttle that was named by children who were studying the history of oceangoing and exploration vessels. The British ship HMS Endeavour was commanded by Captain James Cook in his 18th century voyage in which he discovered Tahiti in the South Pacific. The calculations he made during his voyages was instrumental in calculating the distance from Earth to the sun. He mapped thousands of animal species in New Zealand and AustraliaIt. Endeavour captured the stranded and malfunctioning Intelsat communications satellite after being stranded in the incorrect orbit for two years by grabbing it with their gloved hands, dragged it into their cargo bay, repaired it, attached a second stage rocket to it, re-launched it from their cargo bay, and ignited the rocked they attached to boost Intelsat into its intended orbit. Its final space voyage was to bring a cosmic ray-hunting astrophysics experiment and other supplies to the International Space Station. Endeavour is currently located at the California Science Center in Los Angeles, California. 1998: November 20: the first component (24 ton Zarya module) of the International Space Station (ISS) was launched from Kazakstan. The final component was delivered on February 24, 2011 on board the Discovery Space Shuttle. The ISS is a weightlessness research lab where a variety of tests are conducted for use in moon and Mars missions. The International Space Shuttle Reference Guide is an excellent guide. I also found an interactive reference guide which is an amazing resource. 1983: September 1: Korean Air Flight 7 Boeing 747 was shot down by Soviet interceptors, killing all 269 passengers who were on board as well as the crew. The plane had strayed into prohibited Soviet airspace as the Soviets were ready to launch a missile test. This event almost triggered preparations for a nuclear war against the USSR. 1988: December 21: Lockerbie, Scotland: Pan Am Flight 103 left Heathrow airport in London and 38 minutes after takeoff, exploded over Lockerbie, Scotland, killing all 243 passengers and 16 crew members, as well as 11 people who were on the ground. 179 of the people on board were Americans and 35 of the Americans were students from Syracuse University that had been studying abroad. The bomb that blew up the plane was on the plane: a plastic explosive that was activated by a timer. 1993: February 26: World Trade Center bombing by Islamic extremist groups who lived in New Jersey. Although their intended goal of blowing up the North Tower so that it would fall into the South Tower and bring down both towers was not realized, six people were killed and more than a thousand were injured. Approximately 5,000 people were evacuated. All but one of those involved in the bombing were captured and sentenced to 240 years in prison. 1995: April 19, Oklahoma City: Alfred P. Murrah Federal Building was bombed by a car bomb, killing 168 people. Timothy McVeigh and Terry Nichols were co-conspirators. Timothy McVeigh’s motive was revenge at the way the Waco Siege had been handled. McVeigh was quickly caught 90 minutes after the bombing in a scenario that would be one for the stupid criminal books! An Oklahoma State Trooper pulled McVeigh’s vehicle over because it was missing a license plate. At that time, he found that McVeigh had a concealed weapon and immediately arrested McVeigh. bombing: In response to Osama bin Laden’s fatwas of August 1996 and February 23, 1998 against the United States, 4 passenger airplanes were hijacked by terrorists with the intention of flying them into the World Trade Center, the Pentagon, and possibly the U. S. Capitol. United Airlines Flight 175 left Logan Airport in Boston, was destined for Los Angeles International Airport, crashed into the South Tower of the World Trade Center. American Airlines Flight 11 left Logan Airport in Boston and was headed to Los Angeles International Airport, slammed into the World Trade Center’s North Tower. International Airport, so it was loaded with 10,000 gallons of fuel, crashed into the Pentagon. United Airlines Flight 93 left Newark, NJ Airport and was destined for San Francisco, was delayed from taking off by 40 minutes. Another reference is the result of hearings with recommendations of Improving Homeland Defense. This report states at the end that with the attack that had already occurred on the United States, NORAD (North American Aerospace Defense Command).officials stated that they would have given the orders to NEADS (Northeast Air Defense Sector) to intercept and shoot down the aircraft. However, during the hearing, they said that was not done. However, the 4th hijacked plane crashed in the fields around Shanksville, Pennsylvania. Initially it was thought that the passengers on board the plane may have overpowered the pilot; however, investigations carried out after the crash suggest that the plane had been shot down. 9 Days after the attack, President George Bush declared a worldwide war on terror that would not stop until all of the offenders were captured. 2,977 people died plus 19 hijackers. The United States responded to the terror attacks of 9/11 by initializing a war on terrorism worldwide. Domestically, the United Nations Security Council asked that all nations enhance their efforts to thwart and prosecute terrorists. (permitted law enforcement agencies to conduct searches whenever suspected terrorism was at hand), credit card companies implemented new protocols for handling potential red flags whenever financial levels of charges or transfers were encountered, and Guantanamo Bay Naval Base was established as a holding center for anyone who was involved with terroristic acts. The final act took almost 10 years to complete; however, in May 2011, bin Laden was killed by US forces. NOTE: Another step that has been taken in all states is in order to get a state ID card or enhanced driver’s license, you now must provide a variety of original documents (or signed by a notary public) to document your existence from birth. If you have been married and/or divorced, you must provide a copy of your marriage license and/or divorce decree. You must also provide an original birth certificate or a birth certificate that has been notarized. 2001: Americathrax, FBI’s code name for a series of letters that had been laced with anthrax that were sent through the U.S. mail caused an immediate and significant response by state preparedness responses to other biological attacks after 5 people were killed and an additional 17 people were infected by anthrax. Drills were conducted by emergency responders such as hospitals, paramedics, police, etc. The attack of 9/11 showed that the US had chinks in our armor that had to be immediately corrected (which is why the US Patriot Act and Homeland Security were created). The Anthrax attacks caused the CDC to enhance their prophylaxis formulary. The National Security Division was created by the US Patriot Act and charged with investigating recent terroristic acts and bringing the culprits to justice. As they worked toward accomplishing this task, new scientific methods were developed that actually solved the anthrax attacks. The FBI was going to charge Bruce Ivins for his involvement with the anthrax attacks. Bruce Ivins was a microbiologist who worked for the US Army Medical Research Institute of Infectious Diseases. When Ivins found out about the impending charges to be made by the FBI, he committed suicide by taking an overdose of Tylenol with codeine. 2004: September 1: Beslan School Siege, Russia: Cechen rebels took more than 1,100 hostages (both adults and children) by terrorists who were demanding that the 2nd Chechen War be ended. The end of the siege happened on the 3rd day of the standoff when the terrorists set off explosives. Of the 334 hostages that were killed, 186 were children. 2004: March 11: Madrid train bombing: bombs exploded simultaneously at three different train stations in Madrid during rush hour: one at the Atocha station in central Madrid, one at Santa Eugenia station and the third at El Pozo station. The end result was actually that 191 people died and 1,800 were injured. 25 terrorists were involved: Spanish courts convicted 14 Islamic militants and 4 Spaniards. Seven additional Islamic militants blew themselves up as Spanish police were going to their hideout in Madrid. were injured. 4 home-grown Islamic groups discharged 4 bombs in London at morning rush hour: 3 were at London underground stations (Liverpool Street, Edgware Road, and Russell Square) and one was on a double decker bus at Tavistock Square. At first, officials thought the explosions were due to electrical problems. However, when a bomb blew up on a double decker bus almost an hour after the 3 underground explosions, officials knew it was a terroristic action. As a result, the United Kingdom government began revising British counterterrorism protocols in order to provide greater security by focusing on four individual work streams: Pursue, Prevent, Protect, and Prepare. 1985: September 19: Mexico City earthquake: 8.1 magnitude earthquake devastated the city resulting in total destruction of 3,000 building with an additional 100,000 structures suffering significant damage throughout an area of approximately 825,000 square miles. Approximately 10,000 people were killed and approximately 30,000 and possibly thousands more were injured. 1985: November 13: Nevado del Ruiz volcano erupted with lahars burying at least two towns or villages in the Andes region. Armero, which was located approximately 50 miles from Bogota, the capital of Columbia was the hardest hit and 9,000 of its 29,000 inhabitants survived. Chinchiná was another village that was seriously affected. Armero was never rebuilt; however Chinchiná was rebuilt. 1988: The North American Drought of 1988 began in April 1988 and lasted through June 1988 as a result of the atmospheric circulation of Pacific La Nina and covered 36% of the United States. The cause was due to the Inter-Tropical Convergence Zone (ITCZ), which is a jets tream or band of clouds that circle the Earth close to the equator. When the ITCZ converges with other bands of atmospheric trade winds or monsoonal circulations, extreme weather is the result. When double ITCZs form, the weather is much more severe. 1988: December 7: Spitak Earthquake, Armenia: The earthquake registered only 6.9; however, more than 25,000 people died: the entire city of Spitnak was almost totally decimated and also about 50% of Leninakan was destroyed. The significant death total was the result of the reasons: (1) the Soviet Union only had one building code for all of its regions and that code included no provisions for earthquakes, (2) the length of time it took for local authorities to provide search and rescue missions due to lack of training and/or resources, which resulted in (3) many people froze to death. 1989: September 21: Hurricane Hugo: Although Hugo caused minor damage in Jacksonville and St. Augustine, Florida, it reached a category 4 hurricane with sustained winds of 145 mph when it made landfall in South Carolina. It moved north at the speed of 25 mph and responded to a major extra-tropical cyclone moving across central USA. Damage was exacerbated by the slow response of the Federal Emergency Management Agency (FEMA), which led to some reforms of procedures. 1991: April 29: Bangladesh cyclone: although the population surrounding the Bay of Bengal, coupled with the fact that this was a Category 4 tropical cyclone, which was one of the worst storms to hit the area, what made this so much worse was the inadequate warning system so the population would have sufficient time to evacuate the area. The temperature of the sea was approximately 80 degrees Fahrenheit, which made the atmosphere conducive for the air pressure to drop and the winds to increase. The resulting storm left 138,866 people dead, 138,894 people injured, and 10 million people homeless. 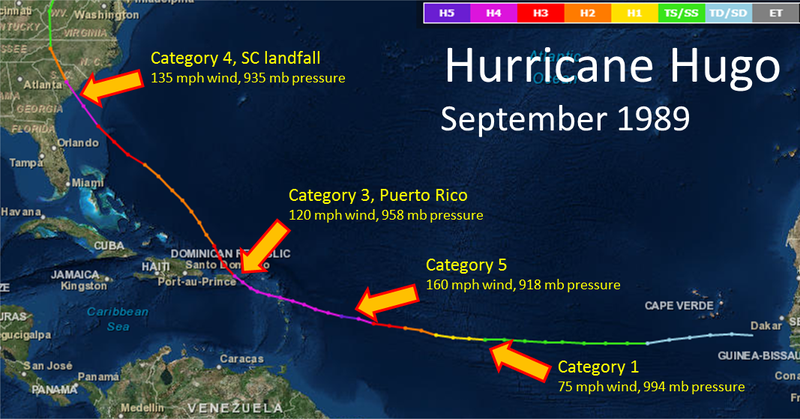 1992: August 16-28: Hurricane Andrew: Initially thought to be a Category 4 hurricane when it made landfall; however, a reanalysis of the intensity was conducted in 2004 upgraded the hurricane to a Category 5 based on the Saffir-Simpson Hurricane Scale. Andrew made landfall in Homestead, FL (southeastern tip of Florida) with sustained winds of 150 mph. 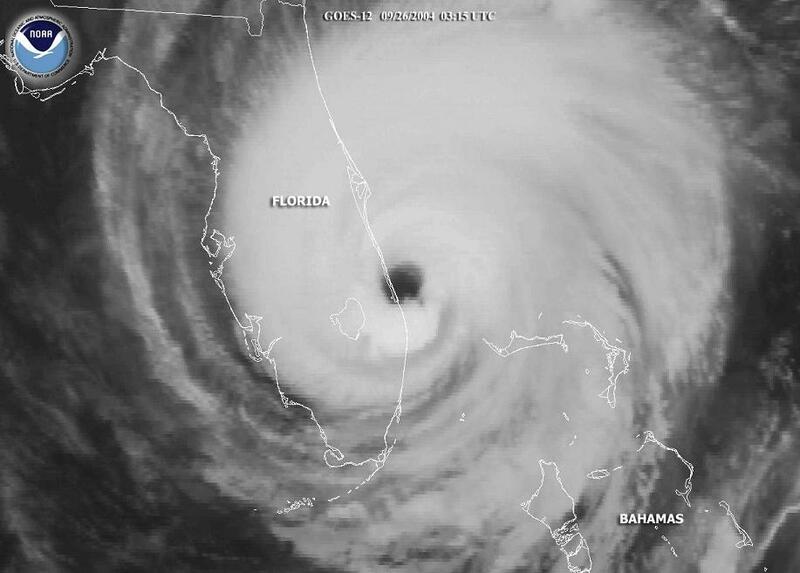 As it crossed Florida (in 4 hours), it weakened to Category 3 and winds decreased even more when it entered the Gulf of Mexico and then built speed again so that when it made landfall the 2nd time in Morgan City, LA, it had sustained winds of 115 with gusts up to 175 mph, lasting for over 12 hours. ranked as a Category 5 storm based on the Northeast Snowfall Impact Scale (NESIS). The storm stretched from Canada and Maine, down the Eastern USA and on down to Cuba. Southern states that never received snow before got as much as 4-6 inches, some portions of Alabama got up to 6-8 inches of snow and other areas of Alabama got 12-16 inches of snow. Also included in this storm were hurricane force winds and tornadoes. 318 people died as a result of the storm and approximately 10 million people lost electricity. 1994: January 17: Northridge, California earthquake registered 6.7 on the Richter scale. 58 deaths, approximately 1,500 people were admitted to the hospital, and an additional 16,000 were treated and released. The earthquake affected Los Angeles, Ventura, Orange, and San Bernardino counties. Anaheim Stadium was damaged, overpasses along the Santa Monica Freeway, Simi Valley Freeway, Antelope Valley Freeway, and the Golden State Freeway collapsed. 1995: July 12 – 16: Chicago Heat Wave of 1995: The heat wave lasted five days with daytime temperatures consistently over 99 degrees Fahrenheit with the highest temperature being 106 degrees F. on July 13 and nighttime temperatures remaining in the high 70s or low 80s. The cause for most of the 750 deaths was three-fold: (1) “Urban Heat Island” factor, (2) people whose homes did not have air conditioning, nor could they afford to buy air conditioning, (3) crime rate caused people not to open their windows, which caused their homes to become like ovens. NOTE: Urban Heat Islands are created when the natural landscape is replaced with many high rise buildings, parking lots, highways and other infrastructure that are not absorbent, thereby creating “landscape islands” of higher temperatures. As the world’s population continues to increase, more Urban Heat Islands will be created unless urban areas are built to mitigate Urban Heat Island effects. The EPA provides excellent videos to illustrate Urban Heat Islands and how to alleviate them via Windows Media Player, Real Player, or PDF There are steps that can be taken to improve Urban Heat Islands by changing the color of rooftops from heat absorbing black to green roofs (which can also increase the amount of food that can be grown!) or cool roofs, planting trees and vegetation, and using cool pavements. If you are interested in finding out about activities and initiatives in your area, check this “Where Your Live” link. 2004: September 15-16: Hurricane Ivan made landfall on Northwest Florida and Alabama as a Category 3 storm causing combined 92 deaths from Alabama, Grenada, Jamaica, Dominican Republic, Venezuela, Cayman Islands, Tobago, and Barbados. This was the 3rd storm in Florida that FEMA had responded to in 4½ weeks. Photo from Earth Observatory. Take a look at the image that was photographed from the International Space Station and made available by NASA on 9/11/2014. The name Ivan as a hurricane was retired as it met the criteria of names to be retired. (near Stuart) in almost the same location as Hurricane Frances had landed just three weeks earlier, as a Category 3 hurricane. See the before and after photos here. The name Jeanne as a hurricane was retired as it met the criteria of names to be retired. Jeanne caused more structural damage than Frances had. 2005: August 23 – 31: Hurricane Katrina: made landfall 3 times; the 1st time as a Category 1 as it entered North Miami Beach, Florida; and the 2nd time as a Category 4 in Plaquemines Parish, LA, and the 3rd time as a Category 3 along the Mississippi/Louisiana border. The death toll for Alabama, Florida, Georgia, Louisiana, and Mississippi totaled 1,833. Hurricane Katrina stats were more than all of the historical stats. That coupled with overwhelmed police presence, levees were run over, extensive damage to the Superdome, which was the location where more than 10,000 evacuees were being held, and the multitude of people who were displaced made this already bad storm a true nightmare. Scenes on television showed a woman in a wheelchair who had died and moved outside the convention center with a note on her lap with her name, pirates commandeered rescue boats at gunpoint, corpses left rotting in broad daylight, and extensive damage to the Superdome, which was the location for evacuees as they were rescued (ended up being more than 25,000 people). Due to the damage, there was no electricity, which meant no running water, toilets that flushed, or air conditioning to run (for so many people being in the same location). Food, water, and medical care was all exhausted. Soldiers were so overwhelmed by the volume of people and the people all frantic to get away from the horrible, nightmarish conditions at the stadium and pushing to get on evacuation buses before they filled up that the military personnel simply let anyone get on the buses, whether or not they were in line. 2005: October 15 – 25: Hurricane Wilma was rated as a Category 3 hurricane when it landed near Cape Romano, Florida. It totally devastated portions of the Yucatan Peninsula as a Category 4 hurricane. It remained Category 4 when it made landfall on Cozumel. Wilma had a large 55-65 mile wide eye as it crossed into Florida. By the time Wilma dispersed, 23 deaths had occurred and a total reported cost of $29 billion. Wilma crossed over migratory paths of migratory birds and most notably: the Chimney Swift that sustained a 50% decrease in population. 1949 and 2011; it formed over the Bahamas and increased and decreased along its path: the winds were at 180 mph as it entered the Florida Straits, and weakened before making landfall on Sabine Pass, TX with winds of 120 mph, crossed into Louisiana that had already been ravaged by Hurricane Katrina the previous month. It traversed along the Mississippi River and eventually dissipated in Michigan. 1981: Prince Charles and Diana Spencer marry on July 29, 1981 – Wedding of Lady Diana and Prince Charles (1981): On July 29, 1981, Lady Diana Spencer (20 years old) married Prince Charles (32 years old) at St. Paul’s Cathedral. Their wedding was large, extravagant, and wondrous. It was the wedding of the decade. Nearly 3,500 people attended personally, 600,000 people lined the streets of London hoping to catch a peek, and approximately 750 million people from around the world watched it on television. 1982: EPCOT (Experimental Prototype Community of Tomorrow) initially was conceived by Walt Disney and initial planning began in 1965. However, Walt died in December 1966 and never saw the opening of his dream of a futuristic amusement park that continually stayed ahead of technology. The acronym EPCOT was the name that the park was called when it opened in 1982. However, the name changed to Epcot (no longer using the acronym) in 1993. The countries represented there today are: Mexico, Norway, China, Germany, Italy, American Adventure, African Outback, Japan, Morocco, France, United Kingdom, and Canada. 1982: Sept. 29–Oct. 1: Chicago Tylenol Laced with Cyanide murders: Seven people, who had all taken Extra-Strength Tylenol capsules all died. Several individual supermarket and drugstores in the Chicago area were the only stores that had tampered Tylenol capsules, so it appeared that this was a local attack rather than on the manufacturer of Tylenol. In fact, Johnson & Johnson offered a $100,000 reward for the capture of anyone involved with this incident. The reward has never been paid. Although three suspects were investigated, one who although not found guilty of actually replacing Tylenol with cyanide but who was convicted of extortion and charged with a 20-year sentence for extortion, and the other two suspects were cleared, no perpetrator was ever found. 1984: December 3: The Bhopal Gas Tragedy, currently listed as the 9th worst manmade disaster in history, occurred when a toxic cloud of pesticide leaked into the air affecting the surrounding area that consisted of hundreds of shanties, exposing more than 500,000 people. This was considered the world’s worst industrial disaster. Immediate death toll was more than 2,250; however estimates vary in different investigations anywhere from more than 3,000 to independent studies that claim more than 5,000. 1985: September 1: A joint endeavor by French oceanographer, Jean-Louis Michel, from the oceanographic institution in France named IFREMER (Institut français de recherche pour l’exploitation de la mer) and Robert Ballard, a professor of oceanography of Woods Hole Oceanographic Institution (a nonprofit research facility that studies all aspects of marine science and engineering) located the RMS Titanic that sank during her maiden voyage on April 14-15, 1912. The Titanic was located approximately 370 miles from Newfoundland, Canada and at a depth of 12,500 feet. 1986: April 26: Chernobyl, currently measured as the 3rd worst man-made disaster in history was caused by a flawed reactor in addition to mistakes that were made by plant personnel caused a catastrophic explosion of the nuclear power plant, which resulted in at least 5% of the radioactive materials being released into the environment (that is 400 times more radioactive than Hiroshima). Estimates of deaths related to the disaster may never be known; however, taking into consideration those immediately killed with those that later died of cancer due to the disaster could be 200-300 thousand deaths. This area will be inhabitable for up to 200 years. 1987: December 20: The MV Doña Paz, Philippine passenger ferry sank after the MT Vector, an oil tanker (carrying 8,800 gallons of oil), collided with the ferry near Marinduque, Philippines and causing the world’s deadliest peace-time maritime disaster. The MT Vector should never have been on the ocean due to safety concerns that prevented the tanker from securing a certificate of inspection due to a steering defect. The ferry, what the capacity of approximately 1,500 people had permitted significantly more than that number of people to board the ferry, with more than 2,000 people not even listed on the ferry’s manifest, as they permitted people who were trying to get home for the Christmas holiday to continue boarding. When the 2 vessels collided, the oil in the MT Vector caught fire that spread to the MV Dona Paz and surrounding ocean. Interviews with the survivors confirmed that significantly more people were on board the ferry than the capacity as they talked about people sleeping in the corridors. 1988: Carrollton (KY) Bus Crash: A drunk driver, who had a blood alcohol level of .24, hit a school bus carrying children and chaperons, killing 27 of the 66 passengers. The bus was on the way back to Carrollton after a field trip to King’s Island Amusement Park. This crash prompted changes in school bus safety. 1989: March 24: The Exxon Valdez oil spill, currently listed as the 6th worst man-made disaster in history, happened when the oil tanker struck a reef and ran aground in Prince William Sound, Alaska as it was headed toward Long Beach, CA, and spilled nearly 20,000 gallons of crude oil and a total of 11.3 million gallons of crude oil. To make a bad situation even worse, the accident happened in an enclosed area surrounded by islands, channels, bays, and fiords. Even today, more than 25 years later, litigation continues and if not settled by June 24, 2016, the period of limitation will expire. Click here for photos. NOTE: 25 years after the accident, the chemical makeup of the area is the same as it was 11 days after the accident and pockets of oil still exist. NOTE: the effects of this disaster are still being seen not only by the oil that still exists in pockets; but also the ecosystem is still struggling to recuperate after the number of sea birds and animals that were decimated. Not only is this affecting the animal population in the area where the disaster happened, but also other animal populations are decreasing due to the lack of food along the food chain. 1989: April 15: Hillsborough disaster occurred at the Hillsborough Stadium in Sheffield, England killing 96 people who were crushed and 766 others were injured. The cause of the stampede was so many fans were trying to get into the stadium in time to see the kick off. A police constable radioed to ask that the game be delayed to avoid a catastrophe; however, he request was declined. 1989: End of Cold War: The term to explain the era of tension, but without war or military involvement, between the USA with all of its allies and Russia and the countries that were aligned with it. During this era, the Berlin Wall was built to divide East Germany from West Germany, the Cubin Missile Crisis** The Berlin Wall was initially constructed by the German Democratic Republic beginning 8/13/1961 and included guard towers. It was built to prevent massive emigration or defection from communistic Germany to West Germany. The destruction began on November 9, 1989. ** Cuban Missile Crisis: an antagonistic period between the United States and Russia when Russia positioned missiles in Cuba aimed at the USA: in October 1962, a spy plane found nuclear missile sites on the island of Cuba that were being built by Russia. President John F. Kennedy ordered US military ships to circle Cuba (it became known as the “ring of ships”) to prevent Russia from bringing in more military supplies. He contacted the Soviet leader: Nikita Khrushchev and both country’s leaders knew that a major nuclear war was looming overhead. President Kennedy knew that it was a rub the wrong way for the USA to have missiles positioned in Turkey, aimed at Russia; so the two country leaders agreed that Russia would remove their missiles from Cuba if the USA would remove their missiles from Turkey. 1991: September 3: Hamlet, NC: Imperial Food chicken processing plant fire killed 25. Although there have been industry fires that caused more deaths, this fire became known due to violation of safety standards. Most of the exit doors were locked, trapping many of the employees. 1991: Jan. 23–27, Kuwait Oil Fires: during the Persian Gulf War, Saddam Hussein deliberately blew up oil wells and set fire to more than 600 that continued to burn until all of them were finally extinguished on November 6, 1991. This had more environmental than military significance. In addition to affecting the Persian Gulf and atmosphere, the sand on the beaches combined with crude oil and hardened forming what is now referred to as “tarcrete”. On January 27th, the United States sent warplanes to bomb the pipe lines to stop the flow of oil that was being released into the Persian Gulf. Up until the air strikes, 240–460 million gallons of crude oil had been released into the gulf. This is currently listed as the 4th worst man-made disaster in history. 1991: December 26: collapse of the 15 Union of Soviet Socialist Republics (USSR) that was established in 1922: Mikhail Gorbachev resigned from office on 12/25/1991 and he transferred all power, including the Soviet nuclear missile launching codes, to incoming Russian President Boris Yeltsin. Prior to dissolution, the 15 republics within the USSR were Armenia, Azerbaijan, Belarus, Estonia, Georgia, Kazakhstan, Kyrgyzstan, Latvia, Lithuania, Moldova, Russia, Tajikistan, Turkmenistan, Ukraine, and Uzbekistan. 1995: States begin banning smoking inside standalone buildings and the first state to enact the ban on smoking indoors was California. With results from five North American studies of local bans and six European studies on national bans, it found rates of both pre-term births and hospital attendance for asthma fell by 10 percent within a year of smoke-free laws coming into effect. On May 28, 1997, the Federal Trade Commission charged R. J. Reynolds Cigarette Company with violating federal law, which had been enacted because their use of Joe Camel mascot as a marketing technique was attracting young people and the percentage of kids who smoked Camels was larger than the percentage of adults who smoked Camels. They actually turned this around and provided a smoke-free Joe Camel kids show. 1995: September: American Telephone and Telegraph Company (AT&T) announced that it would voluntarily restructure. On January 8, 1982, the Bell Operating Companies were mandated via an antitrust lawsuit to break up the AT&T Company, which, at that time, was the largest corporation in the world. The breakup in 1995 finally opened the door to competition such as Sprint and MCI. 1997: July 1: Transfer of sovereignty over Hong Kong: Hong Kong rule was transferred from the United Kingdom to China, ending 156 year British rule. See the Handover Ceremony here. 1999: April 20: Columbine Massacre, Littleton, Colorado: Two high school seniors planned to kill hundreds of students on the 110th anniversary of Adolf Hitler’s birth. 13 students/teachers were killed as were both murders. Policy Act of 2005, which will go into effect on March 1, 2007, will extend daylight hours by at least 4 weeks. The idea of changing the clocks to save energy by changing the clocks so people would experience more daylight hours while they were most active started with Benjamin Franklin; however, it was not introduced in the United States until World War I to reduce fuel by limiting the time that artificial light was needed. After World War I some states continued to observe the change in time until World War II (40 days after the bombing of Pearl Harbor), when it was again observed nationally. The reason we still observe Daylight Saving Time is because of studies completed by the U.S. Department of Transportation showing that 1% of the country’s electricity usage is saved each day. This link shows the dates for Standard Time and Daylight Saving Time through 2018. The whole meaning of “having fun” or “entertainment for enjoyment” has changed because this group has only known technology. This group no longer needs to physical meet with their friends at a variety of locations, because they socialize using social media and online video games. Video games are outranking reading magazines or books. Therefore, because they’re constantly online and primarily with their friends, “having fun” or “enjoyment” is something they do all the time and it is no longer an escape from the trials and tribulations of their daily lives as it has been for all of the previous generations. “Why is this a thing?” – Why is this happening to me? Saved as a favourite, brilliant website! Thanks! I appreciate that you like the info on my website. I struggle with manually entering codes, which is why I use WordPress. That gives me the option to use HTML code or WYSIWYG. Hope that helps.